Although the crime of grand theft auto is punishable by 7–25 years in prison in the state of New York, the location that inspired Grand Theft Auto IV’s Liberty City, Niko Bellic tends to find himself getting executed by firing squad quite a bit too often. The Grand Theft Auto series traces its roots back to 1996, when it was known as Race ‘n’ Chase and being developed for the Commodore Amiga. After a slew of production issues resulting in a generally poor-quality game saw it almost cancelled, developer DMA Design (the company that would become Rockstar North) abandoned the project and turned it into the Grand Theft Auto that we know and love today. A former DMA Design employee went so far as to state that Race ‘n’ Chase was “awful, it was too sim-y”, and it wasn’t until DMA tinkered with the police AI – in response to a glitch that testers fell in love with – that the game was released to considerable success. DMA capitalised on that success, releasing two expansions to the original game as well as a sequel, Grand Theft Auto 2, in a matter of a few months. At the turn of the millenium, times were changing and DMA Design followed suit. Newly minted as Rockstar North, the developer took the leap into the third dimension and made three of the most influential games of the time in Grand Theft Auto III, Grand Theft Auto: Vice City, and Grand Theft Auto: San Andreas. Each game garnered critical and commercial success, and the series became so popular that any title resembling it became known as a “GTA clone.” However, with success comes a cacophony of controversy. Due to the games’ content, Rockstar was accused of glorifying violence to the point that ex-lawyer, anti-video game activist and fearmonger Jack Thompson tried to take the company to court no less than five separate times in as many US states. Thompson’s attempts were shut down at each turn and Rockstar’s parent company, Take-Two Interactive, eventually enjoined him from filing any further lawsuits against Rockstar or any of its other subsidiaries. With this nuisance out of the way, Rockstar was ready to move into the next chapter of Grand Theft Auto’s story..
Having announced the next mainline Grand Theft Auto entry in 2006, Rockstar continued to develop it throughout its legal battles, releasing Grand Theft Auto IV in 2008 amidst incredible hype and fanfare. Grand Theft Auto IV was Rockstar’s big move to high definition and the release of its homebrewed engine known as the Rockstar Advanced Game Engine (RAGE). Grand Theft Auto IV broke industry sales records and became the fastest-selling entertainment product in history at the time, earning US$310 million on its first day and $500 million in its first week. Despite its commercial success, some of the creative directions Rockstar took rendered Grand Theft Auto IV the most divisive entry in the series’ history. The game boasted a more realistic, fluid world not unlike our own, with ultra-high attention to detail. The focus for realism has caused considerable debate within gaming circles online with some loving the heavy, realistic handling, and others complaining that the boat-like steering hinders the gameplay. Some super fans have even gone to the trouble of modifying (or “modding”) the handling settings in GTA IV to resemble those from Grand Theft Auto V, which are more cartoon-y and responsive. On top of that, while Vice City had a delightfully neon-soaked 80s aesthetic and San Andreas had its colour scheme livened up by its spray paint and gang colours, Grand Theft Auto IV’s colour palette – and its overall feel – was one of cynical realism, based around more neutral greys, browns, blacks and whites. This was another point of contention within the gaming community; some gamers loved its more realistic depictions of metropolitan life, while others considered it to be boring, preferring a bit of escapism in their games. After 10 years, though, the question – and the whole point of this article – is whether Grand Theft Auto IV holds up in a post-Grand Theft Auto V world, and it does, but with an asterisk. GTA IV borrowed quite a few elements from previous installments in the series, some of which now make the game feel boxed-in and limiting. When starting GTA IV, bridges between islands are locked down due to a terrorist threat and protagonist Niko is pursued by police if he crosses them. Those blockades are lifted as the story progresses, allowing the player to traverse between islands. If that sounds familiar, this plot point is a mainstay of the series, with Vice City’s bridge sanctions existing due to a storm and San Andreas and Grand Theft Auto V forcing players to stay in Los Santos due to the in-world charges placed on their character. This method of containing the player is an outdated convention designed to streamline the plot, and stifles the open-world exploration that the player wants and the developer trumps as a feature. However, considering games made today still use similar conventions to push forward the plot, GTA IV does manage to hold up in that regard. Unfortunately, in the grand scheme of (Rockstar) things, the plot in question is rather cookie-cutter and not all that stimulating. Niko must find his MacGuffin in order to move on with his life. In this case, the MacGuffin is Darko Brevic, a person who betrayed Niko before the start of the story. Darko is merely a copy of Niko down to the character model. The ultimate goal is not much to aim for though, as the diverse range of characters you meet throughout Liberty City almost make up for the lacking main plot. My personal favourite characters you meet are the McCreary family, and I’ve got good reason to believe that I’m not alone as they do appear in other GTA titles as well, while the Rastafarian drug dealer Little Jacob gives you some of the most enjoyable missions in the game (and is also just a delight to listen to). However, receiving a call from Niko’s cousin, Roman, every 5-10 minutes really causes the game to stall. No, Roman, I don’t want to go bowling. I’m right in the middle of an extraction mission right now. I am glad that Rockstar removed the mechanic where you have to bend to every friend’s whim whenever they call you for brownie points; GTA V would have been unbearable if we had to micro-micro-manage three protagonists’ relationships. As could be expected with the first game on a new engine, GTA IV’s graphics and sound mix are questionable at best, and horrifying at worst. The latter is one of the more egregious issues with the game, as the voice cast is initially mixed in so low that you’ll naturally crank up the volume just to hear them – subtitles are an option, but it’s just not the same – only to be utterly deafened by even the most insignificant of sound effects.. The radio stations offer a nice, diverse group of genres, but the in-car stereo’s initial mix is ludicrously high. I found myself switching off the radio more often than not as it required less effort than manually turning down the master radio volume, but there was no avoiding a few minutes in the menus to fix Rockstar’s mistakes. For 2008, the character models and surrounding environment graphics were probably quite an achievement. However, after we’ve been spoiled by titles like Red Dead Redemption and my personal game of 2018, God of War, the character models reminded me more of Nintendo 64 classic GoldenEye 007 than a high-definition, seventh-generation, triple-A title, and the animations that accompany them look like the work of Jim Henson rather than that of one of the best developers of the past two decades. I mean, if Rockstar was aiming for ugly-looking Eastern Europeans, then it’s right on the money, but every character is just ugly, even Michelle to an extent with the lifeless, deadpan expressions she’s got on her face throughout the vast majority of her cutscenes. It’s like Rockstar North was trying to model its cast of characters as the missing link in human evolution, and it’s genuinely disturbing. I had to skip most of the cutscenes as they remind me more of a House of the Dead arcade machine. The barely-average graphics found in the character models continued into the blocky, undefined environmental models. The buildings and roads look like they’re missing half or more of their original polygons, giving a depressing, otherworldly feel to the place. Throughout the first island, there is a train system that runs above most of the streets. Rockstar implemented a lighting source to bleed through the tracks onto the roads, mimicking the sun, but even with anisotropic filtering at 16x, the shadows from the train tracks flicker at high speeds and are quited jagged and jarring. I have looked for higher definition texture mods, but unfortunately, I haven’t come across one that fixes each of my problems with this game. However, I will say that if you can look past these graphical flaws and old game antiquities, you can find some mods that really breathe a new life into GTA IV by adding new cars, new textures, new gameplay changes and trainers. 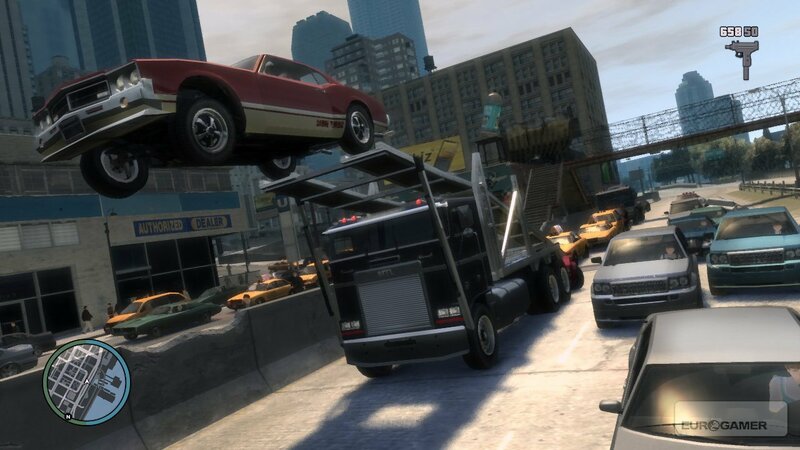 The GTA IV mod scene could really be an open-world sandbox in and of itself, but the true fun – and the reason why people keep on coming back to GTA IV – can be found in the hilarious physics. Drive too fast and slam into a wall, you’ll go flying. Jump in front of traffic, and you’ll ragdoll on the ground. None of GTA IV’s predecessors had such freedom in character movement, where each movement has a certain weight and can have hilarious consequences. Despite all of its flaws – which were nowhere near as glaring back in 2008 – GTA IV was a step in the right direction for Rockstar North. The upgraded in-house engine it had created gave Liberty City a breath of believability. The driving, walking and general world mechanics are top notch and a massive improvement over those seen in Grand Theft Auto: Vice City and Grand Theft Auto: San Andreas. Although it’s all juxtaposed with a very forgettable story (barring the epic set pieces leading to major character deaths),Grand Theft Auto IV is a super enjoyable game and definitely a milestone in the hall of Rockstar’s hit games.